I'm pleased to welcome Christine Freeburn to Cozy Up With Kathy today. Christine writes the Merry and Bright Handcrafted Mystery series. NOT A CREATURE WAS STIRRING is the first book in the series and was released last week. Kathy: Merry Winters loves to craft. Are you a crafter? CF: Yes. Writing and crafting are two of my favorite activities. Kathy: I love to craft, but admit that the learning curve for the Cricut was too much for me and I use a standard die cut machine. Are you as adept with the Cricut as Merry? CF: I’m pretty good using the Cricut, the Silhouette Cameo is a completely different story. I’m going to try and find an online class or some tutorials to get better at it. If anyone has a suggestion, please share. Kathy: Are you anywhere near to being a fan of Christmas as Merry is? CF: Yes. My love of Christmas (and all things Christmas) was one of the reasons for writing this new series. I love Christmas stories/movies and thought it would be fun to write a book featuring a character who has made a Christmas crafting a business. Kathy: I love Ebenezer and was so pleased to see a pocket pet featured as a companion. How did you decide on a guinea pig? CF: With Merry’s business requiring travel and overnights for weekend craft shows, I knew she needed a pet that was portable and one she could take inside with her. CF: I loved the fact that there is a strong sense of empowerment in the stories. Ordinary people (usually women and non-law enforcement) are standing up for themselves and friends and finding a way through some horrendous situations. The main characters in the stories don’t back down no matter the odds against them. CF: Yes, I also write inspirational romantic suspense. 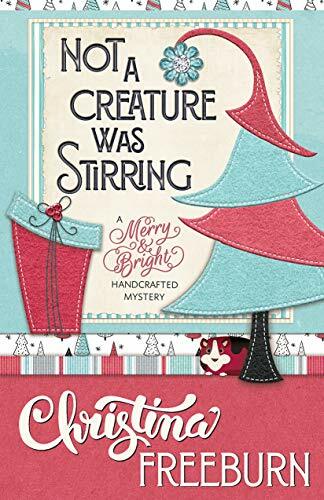 CF: The Merry & Bright Handcrafted Mystery series features crafterpreneur Merry Winters, who worries that her life will be purposeless after her children leave the nest. She finds her life more than full after adopting a furry sidekick and discovering she might have a knack for solving crimes. The Scrap This Mystery Series is a mix of crafty and crime, where country roads lead to family, friends, scrapbooking, and sometimes murder. 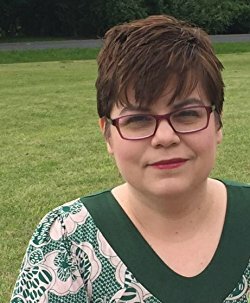 The series features Faith Hunter whose hobbies include scrapbooking, photography, amateur sleuthing, and annoying homicide detective Ted Roget. My New Beginnings Series is an inspirational romantic suspense series that features heroines and heroes that work in a skip tracing firm that specializes in “vanishing”/relocating abused and stalked women. CF: For the Merry & Bright Handcrafted mystery series, the series came about because I was disconnected from Faith, the heroine of my scrapbooking series (Scrap This mystery). I had just become an empty nester and Faith was planning her wedding and dreaming of starting a family and I just couldn’t write from her viewpoint. I decided to start a mystery featuring a heroine who was struggling through the same issue as me, and I gave her my love for Christmas and crafting. CF: I mentioned the new book I was working on to my editor and Henery Press and she asked to see it, so I sent it. Henery Press like it and wanted to publish it and also asked for two others. CF: Pam Andrews Hanson, Hank Phillippi Ryan, Wendy Tyson, and Terry McNemar. CF: My hobbies are scrapbooking, vinyl crafts, crocheting, sewing…basically anything crafty and I love to “plan” Disney vacations. We’ve been a few times (I love it!) and even when I know we’re not planning on going any time soon, I still like to pop onto the Disney website and price vacations. I usually do that when I’ve feeling down and overwhelmed…for some reason it’s a big pick me up. CF: Eggs, wine, green peppers, olive oil. CF: Yes, I’m contracted for two more Merry & Bright books, number two is scheduled to come out in October 2019 and the third July 2020. CF: Meeting readers, especially being able to crop/craft with my readers. Merry Winters has splurged on a new item for her Christmas crafting business-a used RV. It's perfect to transport her and all her crafting wares to various vendor events-and she got it for a steal from her step-daughter. The perfect deal turns into a nightmare when she discovers her recently divorced second husband stuffed into a storage compartment. The detective in charge is certain Merry's the murderer and her sales are plummeting as her step-daughter has arrived and is telling everyone that Merry killed her dad. Merry's adult children are doing what they can to protect and support her, including getting their dad, her first ex-husband, to be her attorney. But will that be enough to make Christmas merry again? NOT A CREATURE WAS STIRRING looks at what it is to be an empty nester as well as the changing relationships as everyone ages. Merry Winters has a big heart, which gets her into a lot of trouble. While her adult children seem to be well adjusted, pleasant people, her step-daughter is an emotional mess, and a constant conflict waiting to happen. Yet Merry goes above and beyond to protect her, regardless of the damage the girl intends to cause. In fact, most of the characters aren't entirely likable.